Scott Lasensky, former senior adviser to the U.S. ambassador to Israel, gives an introduction about Israel’s political system at Jimenez Hall Tuesday night. Ryan Wu/Mitzpeh. Thair Abu Ras, a second-year Ph.D. student in government and politics at this university, said Israel’s current prime minister Benjamin Netanyahu stands a better chance than his opposition of winning the upcoming election on April 9 at a discussion organized by Terps for Israel Tuesday night. The discussion, which took place in Jimenez Hall, was hosted by Scott Lasensky, a former senior adviser to the U.S. ambassador to Israel and a visiting professor in Israel studies. Ras, who co-hosted the lecture, said that in his opinion Netanyahu’s right-wing Likud party looks more likely to win the Israeli election, even though the center-left Benny Gantz, former Israeli Defense Force chief of staff, and Yair Lapid, a TV journalist-turned-politician, enjoy lots of popular support because of their stance supporting peace negotiations with Palestine. “This election is really more about Netanyahu than about anyone else, and he is the person with the highest chance of forming a new government,” Ras said. He added that the upcoming Israeli election would be polarizing because many people who will vote in it aren’t looking at issues like economic policies. Rather, he said, they are more inclined to align their choices with their views on Netanyahu’s character and the government’s approach to the Palestine dilemma, with those in favor of Israeli settlements on the right and those who prefer peace talks on the left. “People either really love him and think he’s a gift from God and others would see him as a total disaster and once he’s out of power, it’ll take Israel a long time to return to its normalcy and refine its soul again,” Ras said. Lasensky added that voter turnout in Israel was among the highest in democracies at 72% in 2015, but identity politics are still visible. He said that many campaign advertisements aim to make candidates seem attractive by portraying them as muscular North African men or strongmen in military uniforms, in Netanyahu’s case. “A large chunk of the electorate still vote based on identity, not voting on issues,” he said. Ras said another interesting aspect of this election is that diverse interest groups along religious, language and ethnic lines may gain seats in the Knesset (Parliament) because of Israel’s low electoral threshold (3.25%) required for a party to be recognized in the legislature. He said there are a few center-right parties on the margin of gaining seats, and it may become harder for them to gain a majority in the Knesset if Netanyahu wins the election. “This is a country with lots of different groups and each of those groups have had representatives in the Parliament, but because of the threshold, people might not be represented as they once were,” Ras said. Lasensky remarked that the electoral threshold in Israel was once lower (1%); in fact, it was the lowest among all democratic nations because of its history of Jews being marginalized. However, this has also caused a problem of “hyper-democracy,” in which so many parties are represented that it becomes difficult to form a coalition. “A higher threshold for parties will lead them to creating more consensus and use that to channel public views, and ultimately making the office [of the Prime Minister] stable,” Lasensky said. Josh Farkas, a freshman mechanical engineering major, said Israel affairs are important to him because he spent a gap year there with his family and might live there after graduation. He said he is most concerned about Israel’s security in the future, given the rocket threats from Iran and Palestinian protests in the West Bank. “Elections are important, especially in Israel when it’s so tense lots of the time,” he said. 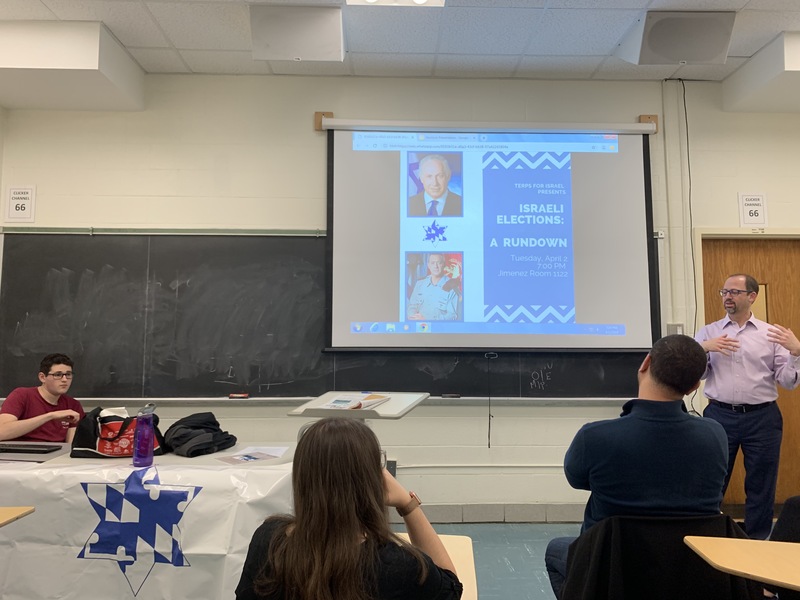 Ben Rosenbaum, a sophomore history and secondary social studies education major and Terps for Israel education chair, said the reason the group invited Lasensky was because many students are concerned with current events in Israel, so they hold educational events to cater to this need. “Some of our members have taken classes with him before; he was more than happy to help us and educate our membership on what I think is an important issue,” Rosenbaum said. No Replies to "Terps for Israel hosts former senior adviser to U.S. ambassador to discuss Israeli election"